Audiences chose the Cubbies over America's Team on Sunday night, and it wasn't even close. Game 5 of the World Series, which saw the Chicago Cubs narrowly avoid elimination by the Cleveland Indians, easily brought in a bigger audience than "Sunday Night Football" with a huge 23.6 million viewers for Fox. That number beat the 18 million average viewers for Sunday night's Dallas Cowboys' overtime win over their rivals, the Philadelphia Eagles. The World Series game was also up 37% over last year's game 5 between the Kansas City Royals and the New York Mets. That game saw the Royals clinch the title. And this is the first time since 2011 that a World Series game has topped "Sunday Night Football" in viewership. As for the NBC and the NFL, the number was down from last year's match up between the undefeated Green Bay Packers and the undefeated Denver Broncos, which had brought in 23 million viewers. 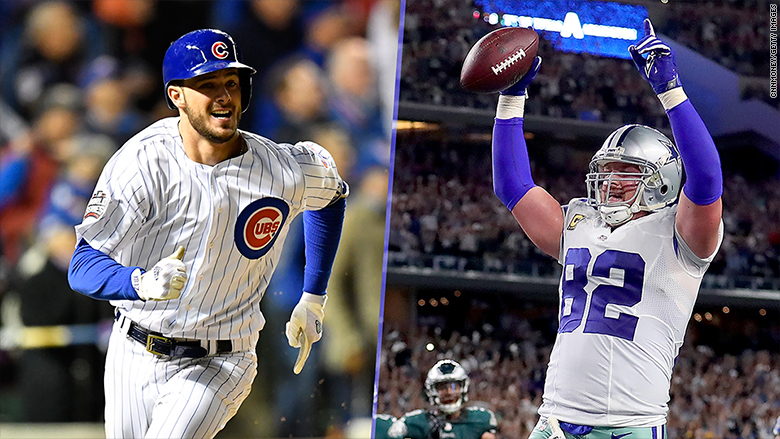 The World Series and "Sunday Night Football" went head to head on Sunday night. This World Series has seen its biggest ratings in years thanks to the Cubs and Indians having two cult-like fanbases as well as the two longest title droughts in baseball history. Alternatively, the NFL, which has been a TV ratings powerhouse for years, has seen its audience take a surprising dip this year.